Miss this webinar at your peril! 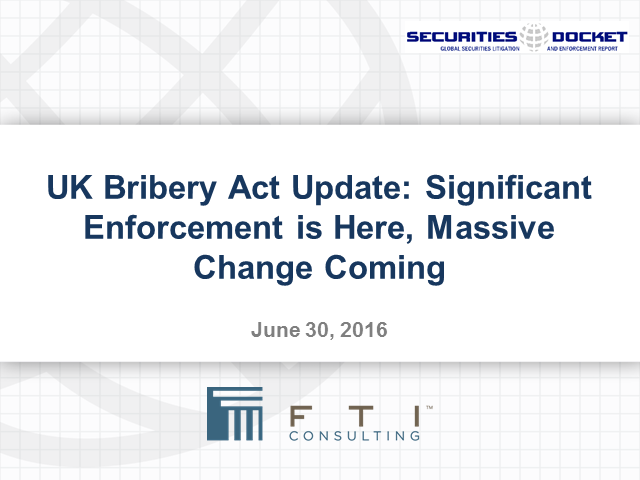 On the eve of the 5th anniversary of the Bribery Act entering into force we have now seen significant enforcement activity in the UK and the UK corporate crime regime is on the cusp of the biggest change in its history that will impact on every business with far reaching consequences for business. 1. Our take on the developments over the last twelve months, including the first DPA, corporate prosecution under the Bribery Act and use of the new sentencing guidelines. · What do the biggest alleged bribery scandal of all time and the Panama Papers have in common? · DPA's v. Prosecution. With no discount for a DPA, what is the point? · The London May Anti-corruption summit and the proposed biggest change to UK corporate criminal law, ever…which will eclipse the impact of the Bribery Act. And you have our personal guarantees, that we won’t discuss Brexit and what that might mean for bribery and corporate crime. At all. Don’t miss this opportunity to hear Vivian Robinson QC, former general counsel to the UK’s Serious Fraud Office and now a partner in McGuireWoods London; Barry Vitou, partner in Pinsent Masons LLP’s London office; Richard Kovalevsky QC, 2 Bedford Row; and Julian Glass, Managing Director, FTI Consulting, as they answer your questions and address these key topics. Our predictions for last year were eerily accurate. Can you really afford to miss it?